I grew up eating Minnesota Wild Rice Soup, traditionally made with lots of vegetables, curls of earthy wild rice, cream, and chicken (or pheasant, as my mom would do when my dad had a good hunting season). We are lucky, as our state is known for it’s wild, hand-harvested crop of this aquatic grass that bears a resemblance to an edible grain. Whereas most parts of the country only have access to wild rice that is commercially grown and harvested, one of the reasons this variety takes quite a long time to cook (whereas hand-harvested is finished in less than 30 minutes). This year I’m happy to be working with House Foods to celebrate the versatility and nutrition of tofu, creating recipes for 10 different states that highlight a regionally inspired dish or ingredient. 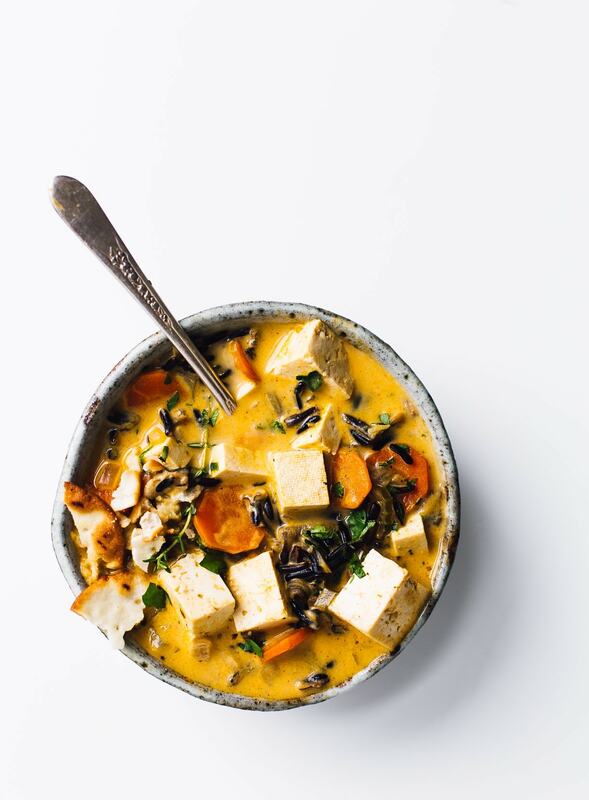 It was natural to pick Wild Rice Soup for my home state, and I have to say – I love the springy cubes of tofu just as much as the traditional meat version. 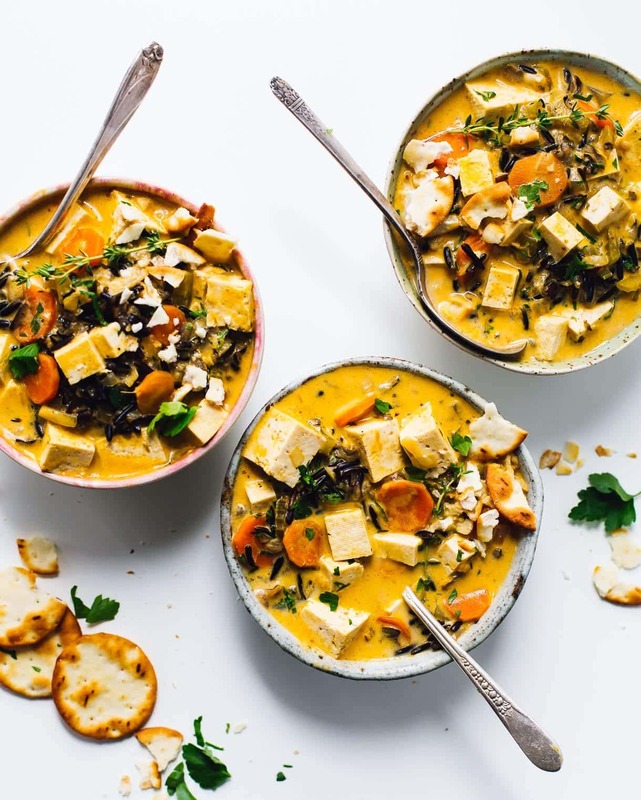 This creamy soup is packed with lots of color, and hearty vegetables like onion, celery, carrots, and a few mushrooms. It simmers with sprigs of thyme for warm undertones, then finished with half & half and interestingly enough – dijon mustard. This post is in collaboration with House Foods, who I will be continuing to work with for the rest of the year. Watch for new tofu recipes on my instagram, or on their website. In a large dutch oven, heat olive oil over medium-high heat. Add onion and stir, cooking for two minutes. Then add celery, carrots, mushrooms, and salt. Stir to coat, and cook for 8 minutes to soften all the vegetables. Add oregano, black pepper, and wild rice, stirring to combine. Then add vegetable broth and thyme. Bring to a boil, then reduce heat to a simmer and cover. Cook for 45-50 minutes, until wild rice is popped and tender to the bite. In a small bowl, whisk together cornstarch and half and half, so there are no lumps. Then whisk in Dijon mustard. Turn heat down on soup so it is not simmering, and slowly add liquid mixture. Stir to combine, then add tofu and gently stir. Let cook for 5 minutes so it thickens. Stir in parsley and serve with crackers or bread. MMMmmmm! Oh my, this is what I wish I was eating right now. I definitely want to try it. Your description makes me want to eat this! As a non-meat eater, I’m actually not that big a fan of tofu. However, when it’s cooked right, I’m happy to eat it. This looks and sounds delicious and tempting to my non-tofu tastebuds lol! Tofu wasn’t always on my radar either, but once I learned how to press it and use it in the right applications, things changed! It holds it’s shape and texture much better. Thanks for stopping by, Heidi! This soup is delicious. I had less than a full block of tofu in the fridge, so I reduced the recipe by half, and I used fresh oregano, but otherwise made exactly as written. 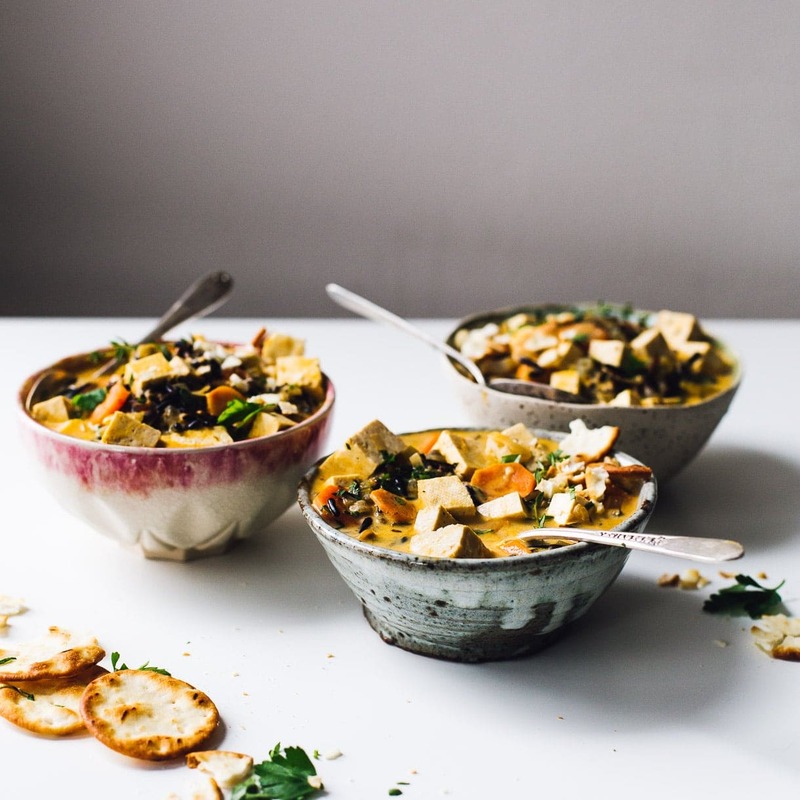 It tastes just like traditional chicken and wild rice soup, except for the tofu. The next time I make it I will probably bake the tofu before adding it to make it more toothsome. Or perhaps add roasted cauliflower at the end or something with more bite. I don’t know that it is necessary to cook the veggies for 10 minutes before adding the wild rice, since it cooks another 45 minutes after that. Everything will be soft, regardless. I like the above poster’s suggestion of adding dried mushrooms. They would be delicious in this stew. I’m so glad you enjoyed it! And I’m happy to know that halving the recipe worked. Cooking the veggies for 10 minutes before the wild rice is essential and should not be skipped, as it coaxes out the flavor of these important aromatics, like onion. The soup would be flavorless without it. It would not be the same recipe, nor delicious, without this important part. Just made this soup tonight. Verdict: It is warm, hearty and delicious! I doubled the recipe, used mixed rice with wild, baked the tofu on a pan first, and used cashew cream instead of half and half (to make it vegan) and it turned out absolutely perfect. I bet it will taste even better tomorrow. Definitely a keeper and will make again. Thanks! yay, so glad you liked it Kelly! i love the idea of the cashew cream to make it vegan. will be trying that this winter! I want to make but don’t have a Dutch oven! What should I do? Also, can I use coconut milk instead of half and half to make it vegan? Also! If I don’t have wild rice, do you think brown rice would turn out alright? Hi Mimi! Regarding the coconut milk + brown rice changes — Coconut milk would change the flavor too much. I recommend an unsweetened almond milk instead, plus an additional tablespoon cornstarch since it will not have as much fat to thicken. Brown rice, I haven’t tried it, so unsure how that would turn out. If you don’t have a dutch oven, a stock pot would also work. Love love love this soup!! So flavourful and it’s a nice change (at least for me) to all the all-blended-up velouté soups. I used whole milk instrad of half-and-half and was very happy with the taste! Thanka for sharing the recipe! I made this soup – delicious! – and swapped out the half and half with cashew cream and it worked perfectly! I used 1 cup of soaked cashews with 1 cup water in the blender. Yay, so glad you liked the soup! And great tip on making it dairy free, appreciate you noting how you made the substitution!